This comfortably furnished 3 bedroom, 2 bath condo in the Cherry Grove Section of North Myrtle Beach is just the place for your next family vacation getaway! Walk out onto the spacious balcony from the living room or master bedroom and enjoy unsurpassed views of the wide sandy beach and the point. Sea Pointe 602 has a separate laundry room inside the condo, making laundry easy and convenient. This well appointed kitchen is equipped with a dishwasher, stove, refrigerator, microwave, disposal and separate breakfast bar. The bright and airy living room is beautifully furnished and features a wet bar. Sea Pointe has everything you'd want in a vacation rental, including on-site pool and hot tub, grill, and sun deck. 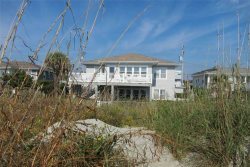 Come spend your summer vacation on this quiet, beautiful stretch of Cherry Grove beach!